As his directorial followup to the-bus-that-couldn't-slow-down-or-it-would-explode action of Speed, Jan de Bont went back to nature, drawing on windy, unpredictable tornadic rage, in a film that served mostly as a showcase for some genuinely impressive visual effects that were not just exciting, but rather cutting-edge for the time (1996). The screenplay came from director/hard science-thriller author Michael Crichton (in tandem with actress Anne-Marie Martin ), yet the Crichton connection is certainly the weakest link here, as all of the characters spill out like one-note cardboard ciphers (albeit colorful), periodically muttering meteorological terms in between maudlin personal stories. They exist�plain and simple�to chase tornadoes and get blown around in a series of progressively larger set pieces. There's really not much to the plot: a rag-tag group of tornado researchers race along country roads in assorted dilapidated vehicles attempting to study funnels and their actions. Mix in some "evil" corporate researchers, a rekindled romance, an experimental piece of equipment meant to improve warning time, and naturally the opportunity for our heroine to face her own personal demons by the time the credits roll. That stuff, however, is just the croutons on de Bont's big movie salad, as the whole of Twister is nothing more than a bunch of loud action sequences where nature's fury gets unleashed in big, big ways. And there's that flying cow, too. But that's almost marginally forgivable if the script isn't quite all it could be, because de Bont fills the screen with actors who make these relatively flat caricatures likeable, even if most have some quirky trait or nickname that is meant to give their particular character immediate, identifiable depth. Bill Paxton, Helen Hunt, Philip Seymour Hoffman and Lois Smith are amongst a gaggle of very familiar faces spread across Twister, and they help in making the personal dramas set in between the next round of tornadoes somewhat more tolerable, especially given the cornball nature of much of what comes spewing out of their mouths. The less said about Cary Elwes' ridiculous accent, however, the better. The meld of certain blocks of dialogue and the overly sweeping and excessively sugary grandeur of Mark Mancina's score, at times, seems to desperately want to push Twister's schmaltz meter way into the red. And just when it almost becomes too much, it's time for another tornado and another thrilling action sequence. The special effects still retain much of their original awe and wonder, and only a few bits show their age. Don't bother trying to compare the constantly fluctuating sky colors and cloud formations within any given scene, because your head will hurt. Instead, wallow in de Bont's increasingly intense tornado encounters. The silliness of driving clean through a house that has blown across the road is tempered by the fact that, well, it looks cool. Ditto for the rain of farm implements that Paxton and Hunt have to dodge as Twister reaches its "finger of God" climax, or the big tanker truck that come flying out of the storm, hurling down the road at our heroes. This 2-disc special edition drops the DTS track found on the 2000 release (how's that for special?) and fixes the infamous cover typo, while the improvements in image quality are pronounced enough to breathe new life into de Bont's sometimes corny-yet-exciting human vs. nature thriller. Image Transfer Review: This remastered transfer is presented in 2.35:1 anamorphic widescreen, and though it still has a few minor issues with brief instances of blocky and patchy fleshtones, the improvement in the overall color palette is striking. Side-by-side comparisons with the 2000 release show much to be thankful for here: grass is greener, skies are bluer, dirt is browner, and fleshtones (mostly) appear very natural. And perhaps the biggest improvement is the way edges and shapes carry much more definition, revealing far greater levels of detail, even during dark sequences. Very nice. But not perfect. Audio Transfer Review: Count me as a whiner in the "What no DTS?" camp when I first heard of this two-disc SE. The legendary boomy magnificence of 2000's whopper of a DTS blend has given way to just a pair of Dolby Digital 5.1 mixes this time around, available in English or a dub in French. The good news is that the 5.1 is still every bit the wall-rattler the DTS track was, utilizing all available channels to create the properly chaotic sense of swirling, windy menace. 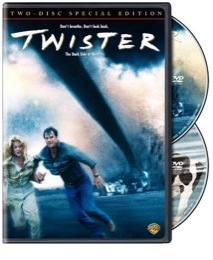 Given the technological improvements the industry has produced, the sound design for Twister has held up surprisingly well since 1996, and elements like the roar of a tornado sound like a freight train. Voices sometimes get lost during a few of the noisier effects scenes, but typically dialogue is clear. Extras Review: Disc 1 of this two-disc set carries the feature film, cut into 34 chapters and available with optional subs in English or French, as well as two Twister theatrical trailers. Ported over from the 2000 release is a commentary from director Jan de Bont and visual effects supervisor Stefen Fangmeier, in which the pair go into great detail recounting the more technical elements of the production. From a nerdy fanboy historical perspective it's interesting, and the level of information is good, yet the presentation is rather lackluster. Over on Disc 2 we're given three more items carted off from the previous release: The Making Of Twister (13m:51s), Anatomy Of A Twister (08m:31s), and Van Halen's Human Beings music video (03m:35s). With the relevancy of the music video in question, that leaves the mini featurettes to look at. Anatomy... ends up a bit on the fluffy side, sidestepping the opportunity to talk visual effects, while The Making of Twister is slightly longer and almost as lite, but it's fairly rich with behind-the-scenes clips and Bill Paxton talking ominously about life in tornado alley. New material is limited to Chasing The Storm: Twister Revisited (28m:56s), with de Bont, Paxton, Fangmeier, etc. yakking up yet another synopsis of the film, the characters, and, naturally, all those visual effects. There is, however, a neat look at the exploding-tanker-truck-that-flew-out-of-a-tornado and house-blowing-across-the-road scenes. Also new is Nature Tech: Tornadoes (45m:15s), a History Channel program that looks at the real deal, and as expected is chock full of scary tornado footage and somber talk of nature's windy fury. I file this one under guilty pleasure. And it's the kind of thing that can show off your home theater sound system pretty well, too. The story isn't much to hang your hat on�one-dimensional characters chase big tornadoes, big tornadoes blow stuff around�but the action scenes are a ton of fun to watch. The brighter colors and sharper edges found on this Special Edition are a definite improvement over previous transfers, though the loss of the infamous DTS track from the 2000 release may be a disappointment to some.